Fall is here and Halloween is just around the corner. I’ve been seeing some classic, creative, and bizarre seasonal emails. Let’s start off with an email from HelloFresh. They’re grabbing our attention with the seasonal pumpkin spice craze, but giving us more than the expected latte. It’s an easy target for them to hit with their food-focused subscribers and the mouth-watering photography to get us clicking for more. This was a well-timed theme with solid content to keep subscribers clicking and reading. I was slightly confused with the subject line “8 ways to pumpkin spice up your life” followed up by a hero message of “6 Pumpkin Spice Recipes (that aren’t lattes)”in an email only containing 3 recipes. But who’s counting when there’s tasty treats in front of you, right? And I did go clicking to find those pumpkin spice pancakes they mentioned. One of my favorite things to find in an email is balance. Maintain your brand, provide new content, and embrace the season. It can be a challenge, and it takes finesse to get it right. AllModern got it right. Their hero image reflects their style but doesn’t conform to the typical halloween or fall imagery. They used copy to provide a modern splash of color which is then perfectly mirrored in the meticulously selected images that follow. It fits with the season, but they didn’t sacrifice their brand or style to accomplish it. The only change I’d like to make is centering their buttons below the images and add the left aligned copy to the button. This would simply the content below the image, allow the button to be larger, and align with the button placement on their website. Subject Line:  Trend Tuesday: Pump it up with pumpkins! Next up, is a Michaels email. Do they send emails too frequently that are too long? Yes, but I sleep better knowing I always have a valid coupon and won’t miss an item I didn’t know I needed. I am also a sucker for a well-done animated gif and today Michaels sent me just that. This animation doesn’t only catch a crafty readers attention, it also provides additional content and inspiration within a few seconds. Plus with the high likelihood subscribers won’t scroll and the extra effort put into gifs, they’ve rightfully placed this profitable content at the top so it can’t be missed. They’ve taken the classic pumpkin and added a creative spin to excite their subscriber. It’s simple, yet valuable. And finally the bizarre… Cards Against Humanity. Doing bizarre and weird things with their emails (and their money) is nothing unusual for this team. This season they’ve managed to roll Halloween, candy, AND politics into one simple email while still getting laughs. 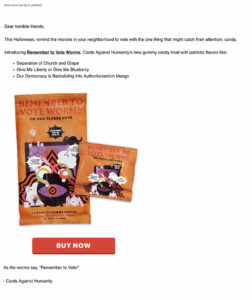 The subject line “Remember to Vote Worms” undoubtedly stands out in the inbox. However, opening this email won’t lead to the typical, robust design. It’s as basic as you can get. They rely on the established interest of their subscribers, timing, and copy. 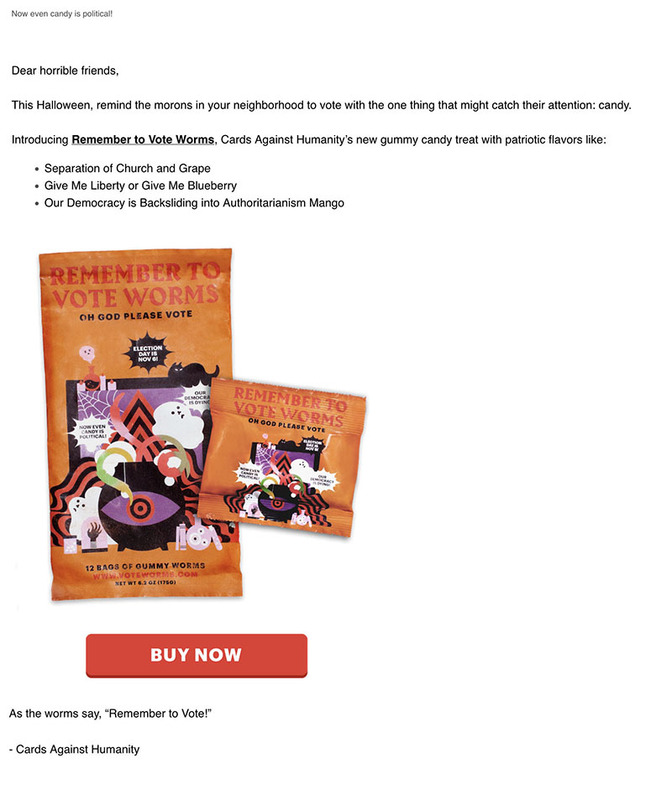 “Buy some Halloween candy, remind your neighbors to vote.” This email example is a good reminder to keep it simple, know your customer, maintain your brand, and work with your available resources. My first thought when I opened this email was, “What the— What’s going on?” The entire email is filled with pumpkins overlapping one another continuously in an animated gif. It didn’t take me long to find the instructions in the subject line: Click on the  to Shop Halloween →. Of course the pumpkins all say “Shop Halloween” as well, but they aren’t immediately apparent as clickable. I liked the use of the pumpkin emoji in the subject line. The email is a unique idea and it definitely got my attention. However, I’m curious how successful the email campaign was. I have three immediate concerns: 1) lack of product imagery, 2) will the instructions in the subject line be overlooked? and 3) is this email too gimmicky? It brings me back to the days of flashing banners to get attention. Are we past that now or does this strategy still work? I’d love to hear your thoughts. Would you click on this email? Let us know what you think on our Code à la Mode Facebook page. 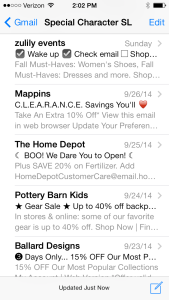 One other observation worth mentioning is that the pumpkins appear quite differently in various email platforms. Here are some screenshots to illustrate. If you’re planning on using a special character in your email or subject line, it might be worth checking out all the versions people will be seeing (email platforms and smart phones alike). You won’t be able to change how it looks, but it may influence your decision about using it all together. See more on special character rendering in subject lines from a previous post by Lyla here. This email cashed in on current trends of mobile viewing and social media commenting. I loved how the comments they came up with both highlighted the discount as well as added cute takes on the products. My favorite: “My apartment’s gunna be like #yaaaassss.” The hashtags in the subject line were extra icing on the cake. Amazing. Subject Line: Thanks for your order! “Your Receipt From the Future,” as the email states. It’s designed to look like a receipt, but it’s a promotional email. I’ve never seen anything like it and I found it so interesting. I’m sure anyone that saw the subject line “Thanks for our order,” had a double take – wait, did I order something? I loved how instead of listing products by name they used phrases like, “That sofa you’ve been eyeing.” Their incorporation of the links were also well implemented. It was a departure from their regular, graphic-filled emails and I found it very fun. This is just one of many examples highlighting their fun wordplay. I have to admit, I got a little chuckle when I read the numbered list. I absolutely LOVED these “Gift of the Day” gifs that appeared throughout the holiday season! They were such fun and well made animations that I looked forward to seeing every time. 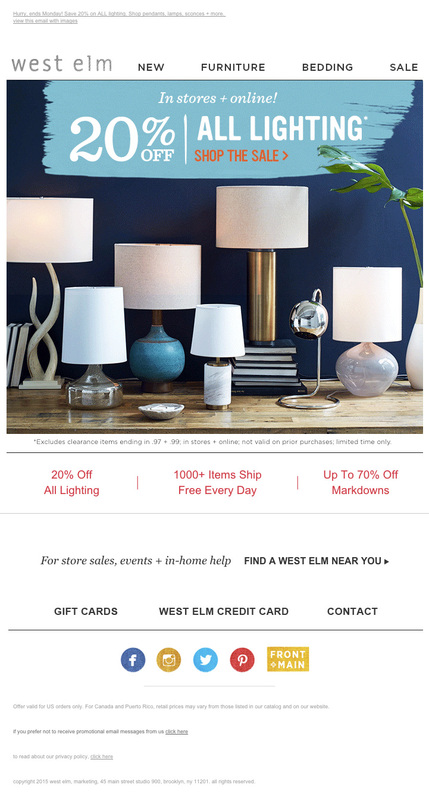 It would have been easy to just use the image of the lamps, but West Elm went the extra mile. They really made this email stand out by making the lights switch on and off. Also, take note of the wordplay in the subject line. Subject Line: EVERYTHING’S on sale. Starting…NOW! The perfectly aligned square design is hard enough to achieve on it’s own, but West Elm took it a step further by animating and swapping words to give this email layers of meaning. I watched, entranced, waiting to see which combinations they had come up with. Let’s face it, opt-out emails are scary — you worked hard to get those subscribers. A bad list though, and it’s straight to the junk folder. I suggest your opt-out email remind them WHY they signed up in the first place. If it’s for your spectacular products, make them the focus. Your unique style? Show it with an amazing design. Maybe it was an added bonus they received by signing up, so throw in an offer they can’t refuse. 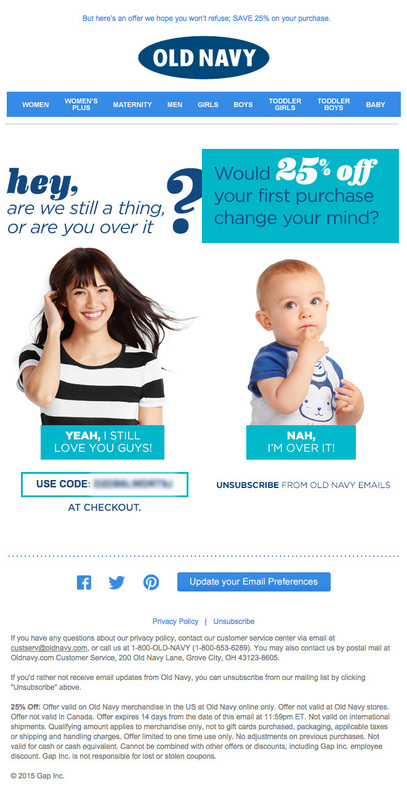 For Old Navy, it’s their spunky attitude and great deals, so that’s what they put into their opt-out email. I love the wording they chose, both in the subject line and email — it’s right on target with their style and audience. The design, however, leaves something to be desired… but for the brand it still works. Pre-header Text: And that’s just fine by me. How could anybody not click open an email with a subject line as tempting as this?? Bonus points to the Solestruck team for providing pre-header text that pairs so well with the subject line. When viewing what’s in the inbox we see: I’M NOT YOUR TYPE And that’s just fine by me. One coding recommendation from the Code à la Mode email team would be to provide alt text in the HTML files for the image slices in the hero, as subscribers with images turned off in their browsers will not get the primary messaging. One of the topics which the Code à la Mode team is most frequently asked is in regards to special characters in email subject lines. Mostly, our clients want to know how to insert them into their subject lines. Fortunately, this is the easy part! All you need to do is copy and paste from a page like Facebook symbols (or select from the Symbols and Special Character Numbers at the bottom of this blog post). Bear in mind, if you are using special characters in the content of your email, you will need to use the HTML character code, many of which can be found here. While some email marketers rally against using special characters in subject lines on the principal that they believe them to be too gimmick-y and/or perhaps that there is an over saturation of use in the inbox, we believe that if you do your research and testing, they can be a valuable asset to your campaigns. Like with anything, the key is to test, test, test! Check your email clients! The major ones (Gmail, Hotmail, and Yahoo) typically render special characters well, but you’ll want to ensure you are getting what your hoping for in your mobile devices as well, as over half of all email opens are now done from smart phones. Some special characters render prettier on smartphones than desktop. 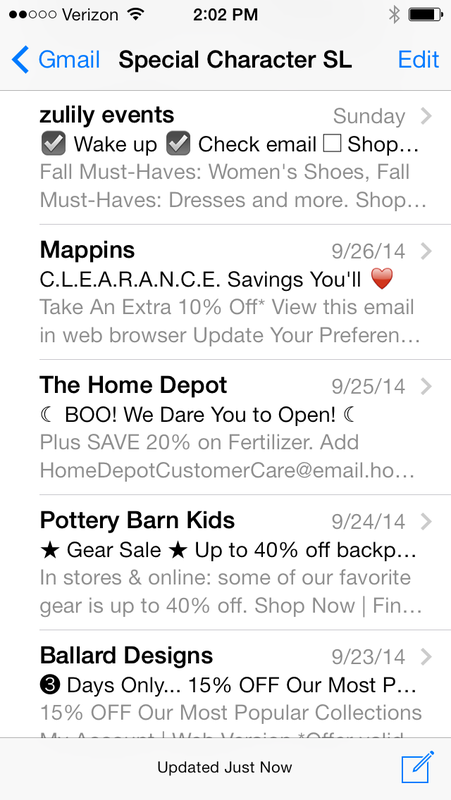 See below for recent subject lines viewed in gmail desktop vs. iPhone native mail app. Finally, once you are pleased with the rendering of your special character, don’t forget to test your subject line. A/B subject line tests are a MUST, regardless of whether or not you are testing the potency of special character usage. We recommend that email marketers everywhere to be ever vigilant with testing different subject line options. If worried about losing potential sales due to a great disparity in performance between your 2 (or more) options, there is always the ability to deliver a small batch pre-send to a limited percent of your list, before deploying to the full file. J. Crew hit it out of the park with this subject line. Who could possibly resist Puppies!!!? On another note, the J. Crew email creative team is doing nice work with their mobile optimized emails. This one renders prettily whether viewed on desktop, mobile or tablet, and features bold and brief headlines, short and sweet copy, and easily clickable CTAs (call-to-action). Subject Line: Happy Mother’s Day! This Mark and Graham email was the highlight from the email inbox yesterday. 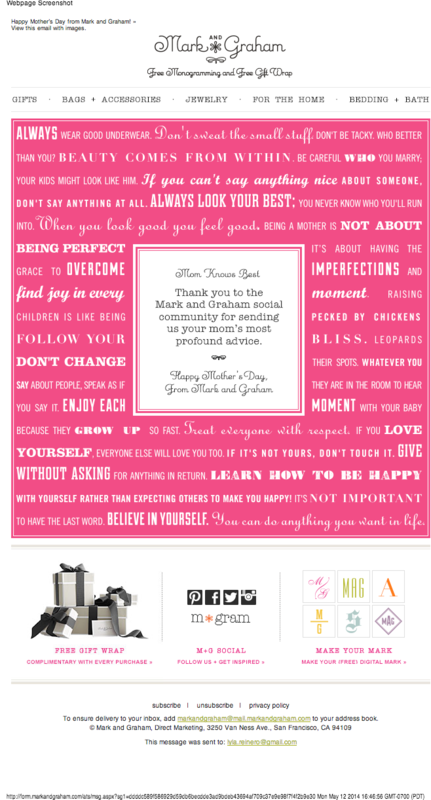 It is nice to get a reprieve from the barrage of emails directly marketing products and promotions, and we LOVE M+G’s creative use of social media to engage with their subscribers and customers. Mark and Graham used twitter and Facebook to ask its audience to submit their mom’s wisest words, and then compiled the best for this email. 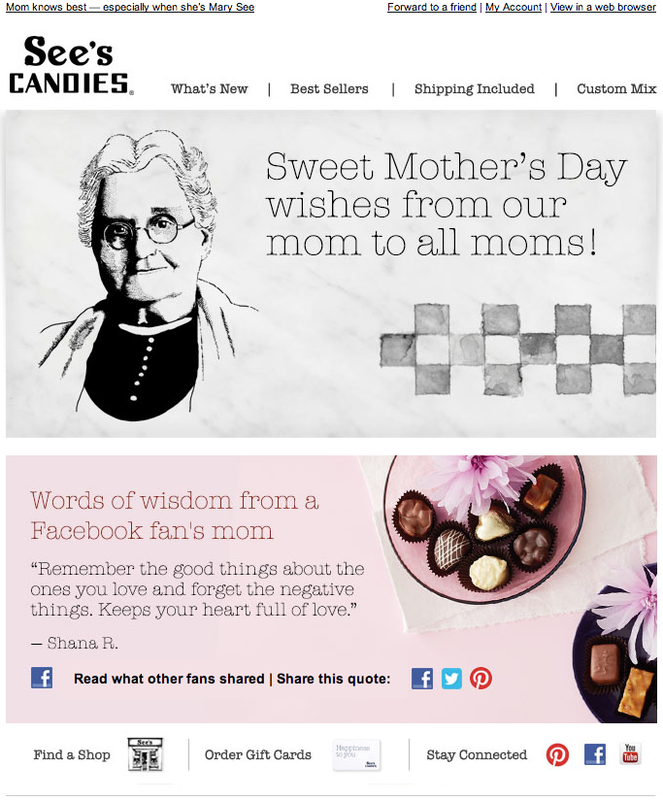 The result is a win-win email that wishes its subscribers a happy mother’s day AND thanks it’s social community for contributing. Subject Line: Don’t forget M❤M, it’s not too late! Gotta give credit to buy buy BABY for giving the ultimate procrastinators one very VERY last-minute chance to get something for mom with this email promoting eGift cards! While we love the special character in the subject line, we wouldn’t recommend the placement of “Please drag and drop this message to your Primary tab so you don’t miss future emails” in the pre-header. This is for 2 reasons: 1) although we are guessing the reference is to Gmail tabs, the directions are confusing and not applicable to all email readers, and 2) the first line of the pre-header typically appears in the email preview pane, and is therefore valuable email real estate that is not being used to its full potential here. Ideally, the pre-header should provide content that is complimentary to the subject line. Subject Line: Happy Mother’s Day from See’s! See’s also used social media to mine the words of wisdom from the moms of subscribers for their Mother’s Day send. The email featured just one select quote, and then had a link to the full Facebook conversation, as well as social links to share the quote on Facebook, twitter and Pinterest. Subject Line: Call mom. Then shop 40% off. We like the directness of the subject line, and appreciate the reminder to call our moms (not that we would EVER forget!). Thanks LOFT! Subject Line: We Love Moms! As the subject line tells us: We Love Moms! Awww…thanks, Tea! We love you back! Like Mark and Graham, Tea sent its subscribers a non-promotional blast. The main body has a sweet Mother’s Day greeting and an invitation to “Meet our 2014 Inspiring Mom Award Winners”. Unfortunately, Tea misses an opportunity for increased subscriber engagement, as this section was not linked, and was elusive to find the on the Tea website as well.